I’ve been trying to define lots of things into existence! Like Peace On Earth! Will keep you posted on my success. ha ha! Kant thought that Euclidean geometry was the only imaginable geometry and therefore had to be true of the Real World. It’s definitely not the only imaginable geometry, and we still don’t know if (on very large scales) it’s true of the Real World or not. This is a good representation of Saint Anselm’s ontological argument. However, perhaps Barmaid could have attacked the word “perfect.” To say that, because we can observe graduated levels of abilities, such as better and still better basketball players, and we can image a “perfect” basketball player (than which none can be greater), it doesn’t follow that, by definition, there exists a perfect basketball player. Barmaid’s argument appears to be a variant of my “basketball player” argument. 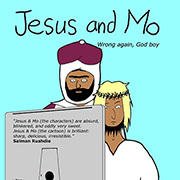 There are many beers (pints) of varying qualities, and even if Jesus can imagine a “Perfect” beer, Mo’s “perfect beer” will not necessarily be Jesus’, and neither can be said to exist. (but after a few good cool ones, who cares?). Then, there’s the idea that we must mirror the “perfect” Being as much as possible in order to make ourselves better (to be Godly, as it were). Such an idea brings up interesting arguments, such as: a great number of abortions occur naturally, or, as an “act of God,” some would say. therefore, we should not fight the right to induced abortion. To induce an abortion of some pregnancies, then, would be a “Godly” thing to do. On that same vein, homosexuality should be accepted by True Believers, because there are many babies born with both male and female reproductive organs. Such children should be revered as being special in the eyes of God, whatever God may be conceived to be. A god, then establishes “natural law,” and natural law is that which can be discerned in nature. This is a fine cartoon. It sparks more thinking. Well, this is obviously Descartes’s ontological argument, and the counter-argument in the cartoon is absolutely the best. 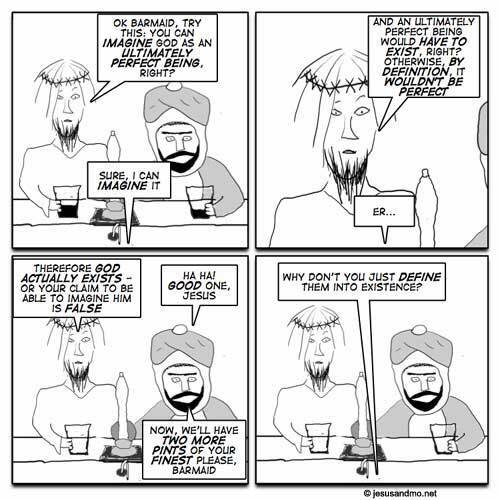 There is no need to say anything further to completely refute this stupid argument often used by religionists. It is also worth mentioning that a certain notorious philosopher named David Chalmers is promulgating various forms of the same kind of conceivability argument to posit immaterial souls and superstitious stuff like that. The Brights must not allow passage to these medieval ideas. In my imagination, the ultimate perfect being is untainted by anything as base as actual existence. So, by the same argument as Anselm, god therefore does not exist. One philospher turned it around on itself and also demolished creationism in the process. Consider the universe and it’s immense complexity, could you imagine that if it was designed by a intelligent and capable being how magnificent that being must actually be in order to achieve such a thing? Then imagine how much more incredible and amazing it would be if that being was less intelligent and less capable and still managed to do it? Indeed, following this, the most incredible designer possible (the most perfect) would be the one who managed to create the complex and infinite universe while handicaped by not existing! Ontological argument – a sucker punch. Retort and rebuttal – Bruce Lee-esque roundhouse kick to the face. Actually we aren’t able to imagine a perfect being, since we are such imperfect beings ourselves as to not have a concept for it or being able to grasp such a concept if such existed. Thus I consider myself as agnostic verging tending on atheism: I think the existence of God is highly improbable, but accept the idea that such a Being might exist outside the constraints of my feeble imagination capacity. What I really abhor is all the people who not only are absolutely convinced that God exists, but who are so presumptuous to think they can actually infer the intentions of such a Being and obtrude their perceived “knowledge” on their fellow humans – starting with but not limited to the authors of any kind of “holy” book. Erm – this might seem a nit-picky (and belated) point, but when Mo says “Two more pints OR your finest, bar-maid”, what kind of choice is he actually offering her? I miss Douglas Adams… Thanks, fenchurch! I’m still rather confused on why the existence of an entity would automatically mean worshipping it. My cats exist, I don’t worship my cats. How is this concept difficult in any way?